Our traditional canvas marquees are ideal for all occasions. They are commonly used in the hire market for weddings, parties and the entertainment industry. They are used at festivals by catering companies and the smaller marquees for displays and exhibitions. The basic shape of our marquee is a dodecahedron, (a twelve sided circle). It is made up of 2 roof sections and 4 side wall sections, any of which can be removed to provide an open/partially open covered space. 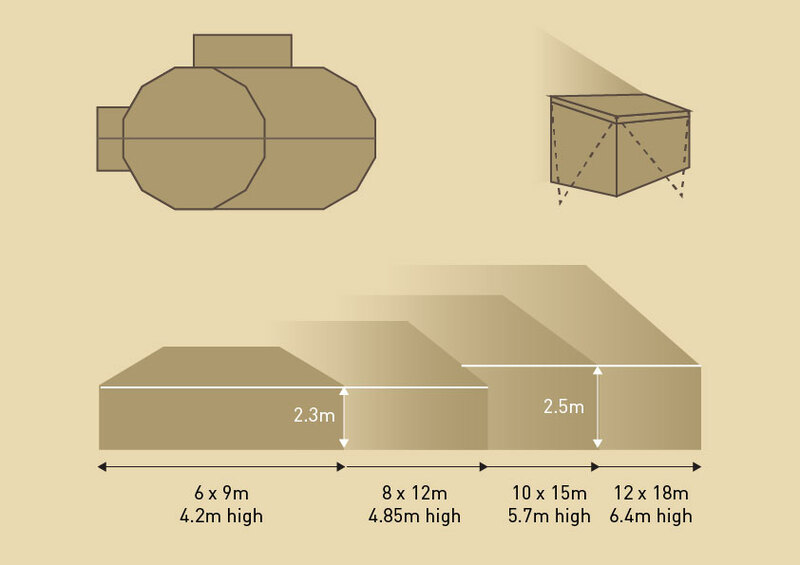 With the addition of a central roof section you can extend your marquee by half its diameter, thereby creating an oval. Apses can be added to the sides to create either more internal space or a closed off area for storage etc. The main advantages of this type of marquee are its adaptability, luminosity and relatively quick and easy construction. All of our marquees come complete (unless otherwise requested) with poles, pegs and rope. Upon request we can divide the centre pole(s) making transportation easier. Our 360g (12oz) canvas is made of 100% natural cotton, the 420g (14oz) canvas is a 50% cotton 50% polyester mixed weave and the flame retardant canvas is 393g (13oz) natural cotton. Our covers are very durable and we are happy to advise as to which is best for your needs. For heavily used marquees we can provide and would recommend using a 30cm vinyl strip (available in a range of colours) on the bottom of your wall sections. It is a very durable material. This section trails on the ground and therefore the canvas is far more vulnerable here. We are always happy to advise as to which material is best for your needs. Our canvas comes as standard in a natural off white colour. We can also make your marquee in the colour(s) of your choice but please note coloured canvas is only available in 300g (10.5oz) weight.